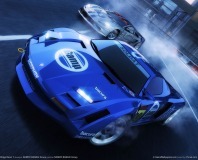 Namco has announced a new Ridge Racer title for PC, Xbox 360 and PS3. New reports suggest that lucky punters could get their mitts on a playable version of the latest in the popular racing series at the LA Expo. The PSP has launched in the UK and has had record sales in its first week in stores. We have the details. After grabbing an early Sony PSP and playing it non-stop for over a month, Wil Harris thinks that he's about got the measure of the portable gaming super-console.